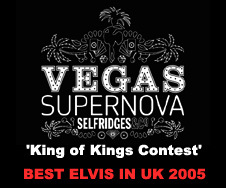 Sunday April 17th 2005 saw the gathering of nearly 60 of the very best Elvis Tribute Artists in the UK to take part in the 'King of Kings Contest' held at Selfridges, London. The first heat allowed each entrant to sing for about 1 minute, acapello, an Elvis Song of their choice. Neil says "Anyone who thinks these contests are easy, should try them! Having to chose a song, knowing you have to sing it without any backing and that you only have one minute to put over to the judges the very best in you - is challenging! I chose 'You Don't Have to Say You Love Me'. It is a powerful song which can show Elvis full range and also because it's starts without an intro - just the voice going straight for it!" It seemed to work for Neil as he made the finals in a very competitive and strong field. The final ten contestants were then allowed to sing 2 songs to backing tracks. Neil says "After a lot of thought I went for the safe and tested format and chose the two songs that did so well for me at the Blackpool Contest - How Great Thou Art and Blueberry Hill/Can't Stop Loving You Medley. I was nervous just before my performance. The gremlins start to play tricks before you go on stage but completely disappear once you step out in front of the audience. I enjoyed singing the songs I chose - they are such powerful songs and Elvis sang them from the heart." After a long deliberation the judges finally made their choice and voted Neil as outright winner of the contest. Neil will now take his Elvis Tribute Show and perform live in Las Vegas at the Paris Casino Hotel at a date to be fixed. Neil says "Like a lot of the other guys here, I came here today to meet up with a few old friends and make some new ones. Winning the contest was both unexpected and a hugh surprise. When I looked around and saw the talent in the room it made me feel very humble. Performing in Las Vegas is a dream for every Elvis Tribute Artist, even those based in the US, and I am really looking forward to 'living the dream!'"